Bargain Printing offers an array of choices for quality brochures. From full color to spot color, text or card stock, to the folding type of your choice, Bargain Printing is able to print any sized brochure order, no matter how large or small. 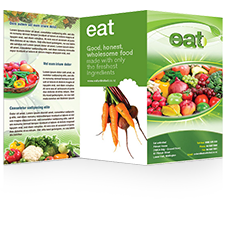 In combination with the Bargain Printing easy online ordering system and Fanatical Customer Service promise, your next brochure order will be easy to place and receive. Bargain Printing now offers complete printing and mailing solutions to any size business. By printing and mailing your pieces with us you are saving time, money and above all it is convenient. Provide us with your artwork and mailing list and we will take care of the rest. Quality printing, fast and reliable mailing service, now under one roof. So, why do you need a brochure? Everything’s on your website, right? But why not give your customers a choice? Delivering a print brochure - in addition to directing them to your homepage - can show them the highlights, the overview, the direct benefits of your business in a way they can use at their convenience. You can let your customers know a little more about you by speaking to their needs. And it will supplement your online presence. How many times have you stopped in a restaurant and picked up the takeout menu? Isn’t it all about convenience? When you want to remember the place with the great customer service or the types of products you enjoy, you can reach for the print brochure, you can keep it on your desk, and you can pin it to your board. It’s a colorful way to stay in touch with your customers and remind them why they chose you in the first place. Having a great brochure handy when you meet with your clients can make all the difference in a sales call. You can put your business in their hands. Now they have something memorable to read in addition to your business cards. You can reinforce your strengths and underscore your place in the market, and using a brochure in a follow-up mailing is a simple next step. 5.5" x 8.5" 8.5" x 11" 8.5" x 14" 11" x 17" 11" x 25.5"
You will be asked to provide your mailing list later in the process. Maximum Quantity to be mailed should not exceed 20000. For larger quantities, please request a quote.